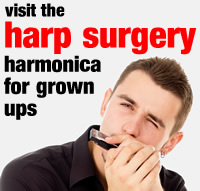 The Chromatic harmonica allows players to flow up and down in whole or half steps (chromatically), without the need to physically bend reeds into pitch. It contains all the reeds needed to cover the black and white notes of a keyboard. 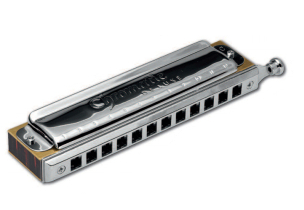 So with just one Chromatic harmonica, you can play in every key – be it major or minor, and play and type of scale from pentatonic to blues. How does it all work? With the help of a shutter, or slide. As with the Chord and Octave harmonicas, the Chromatic also has two rows of holes. Each hole contains one natural and one chromatic (sharp or flat) note. The slide covers the chromatic notes until you press it in – whereupon the chromatic notes are opened and the natural ones covered. Chromatic harmonica reeds are arranged in octave groups (eight notes); a pattern which is repeated across the harmonica. We call this solo tuning because it is designed for playing melodies rather than chords. You would normally hear Chromatic harmonica in jazz and classical music, but it’s is also played in blues, funk, rock and pop music. Our favourite Chromatic harmonica player is Stevie Wonder. Here’s Brendan Power from Suzuki Hamonicas demonstrating the Chromatic Harmonica.